Former Real Madrid manager Zinedine Zidane is reportedly confident he would be offered the Manchester United job if Jose Mourinho got the sack at Old Trafford. The French tactician has been out of work since he stepped down as Real Madrid boss at the end of another hugely successful season last term. 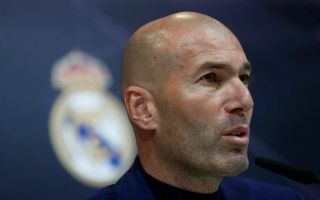 In less than three full seasons in charge at the Bernabeu, Zidane helped Los Blancos to three Champions League title wins, as well as one La Liga title victory. It seems clear he could therefore be a major step up from the struggling Jose Mourinho, with the Portuguese’s future at United looking increasingly in doubt. It has been a difficult start to the new campaign in Manchester, and it’s now claimed the club are aware they may need a plan in place in the event of their manager’s departure, according to the Daily Mail. The report adds that Zidane has told friends he wants the United job and that he believes he’s the leading candidate in case Mourinho does end up leaving. MUFC fans would surely be pretty happy with this, with Zidane likely to be more suited to the kind of football the Red Devils became known for playing in the Sir Alex Ferguson era. The 46-year-old had his Madrid side playing some fine football, and clearly also motivated them well in the biggest matches. With the Mail adding that Mourinho’s relations with French flair players Paul Pogba and Anthony Martial are also strained, Zidane seems ideal to come in and get the best out of them and restore their confidence. Man Utd fans, would you be happy to replace Mourinho with Zidane? United face Tottenham next in the Premier League and a win looks crucial to avoid a real crisis for Mourinho, who does have the recent habit of seeing things go pear-shaped for him in his third seasons with clubs, which this now is for him at Old Trafford.